Well, here we are again, back at the Riverton Forge and Wheelwright Museum at Scholz Park. 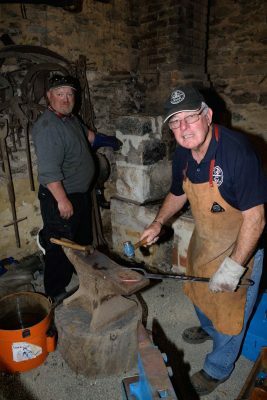 The Blacksmith and Wheelwright museum featured in the ‘Open Day and Night at the Museum’ . Part of the South Australia History Festival of May. 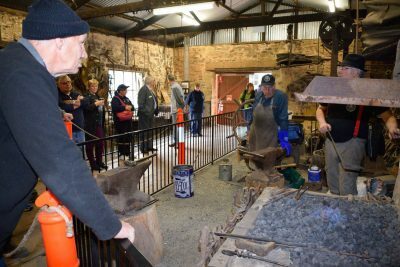 Members of the Artist Blacksmith Association South Australia had a vital part to play in being part of the picture on this special day. Our day was to start at 1 pm and work through the afternoon into the night, until 8 pm. Members attending included Hugh French, Leon Elix along with John Such, Brian Dreyer and Anthony Helbig. While we were there, the walkway was filled with onlookers watching the smiths in action. Some of the many visitors through the forge during the day. Hugh and Leon teamed up at the forge while Anthony and John fired up the second forge. Anthony and John entertaining the visitors. 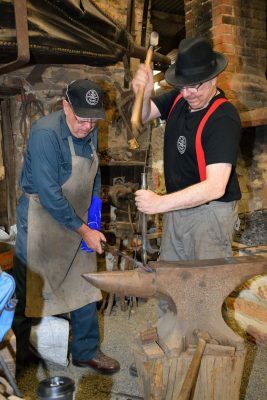 The museum was also blessed with the appearance of a visiting wheelwright to describe the tools and items in the wheelwrights shop. Wheelwrights and Blacksmiths worked hand in hand during the days of the horse and carriage. Some of the tools the wheelwright used are as unique as they are rare. Meanwhile, on the lawns of the park, the crowds enjoyed the autumn day with a host of goodies served up by the dynamic Lions club members. A selection of tasty soups and desserts along with coffee and tea was just the ticket to keep the autumn chill at bay. We plan to have a blacksmith attending the forge on the last Sunday of each month. So, if you have a few hours to spare, come on up and enjoy the ambience of a bygone era.